Source Software is an insurance aggregator, allowing insurance/mortgage brokers to sell from a stable of providers. The business model is based on a % of business transacted using the software, being directed to Source Software – so volume was key. But how do you keep existing brokers and attract new brokers in such a competitive marketplace, how do you stand out and create brand personality? It was clear that Source Software needed to identity their differentiators and then communicate these to their audience. 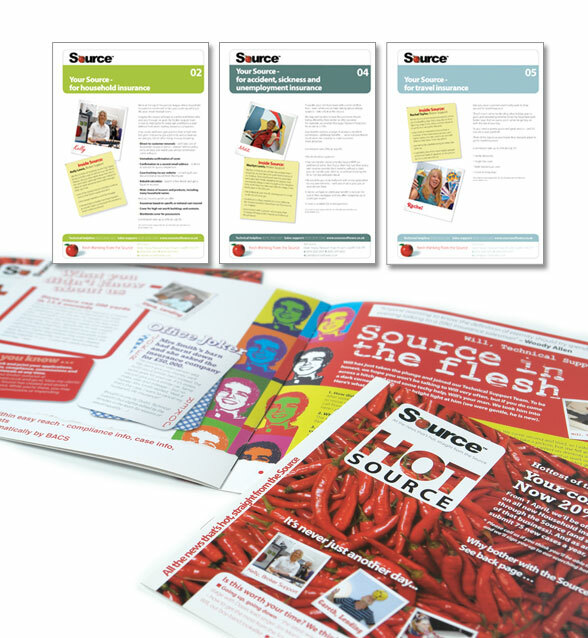 In order to stand out, a strong brand personality needed to be developed, so in conjunction with the copywriter at Source Software, we designed and artworked a newsletter to all brokers. Highlighting the USP’s was key, but also to bring out the softer side of working with Source Software, so we photographed and featured the faces and personalities of people working at Source Software – those people that the customers would talk to along their buying journey. This key customer communication piece helped to build closer relationships between supplier and customer, building on the softer values of Source Software, such as customer support and buying from individuals rather than a business.